On Saturday 25th March you are invited to a showcase of the work of the Brighton and Hove City Mission. There will be interviews and entertainment, accompanied by light refreshments. Taste and See is an opportunity for our supporters, old and new, to find out about how our missionaries are reaching our city. Over the last few weeks the Schools Team have been delivering their brand new RE Day. After a number of schools had been requesting that the team might present an overview of the Bible, they created and delivered the newly named ‘Bible in a Flash’. It is an interactive and fun look at many characters and stories that thread through the Bible. It traces the line of Jesus, allowing children to hear about a God who loves his people and wants them to listen to Him. It has been hugely popular with the children and teachers alike. Another said ‘The children remembered lots of the stories and gave lots of positive feedback about their experience. 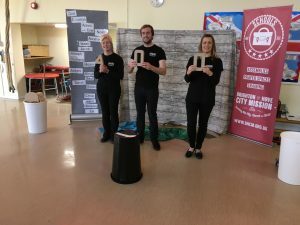 They loved the use of the cloths!’ She added ‘The [KS2] staff and all the children thought it was great and it has definitely kicked off our ‘Year of the Bible’ with an impact. 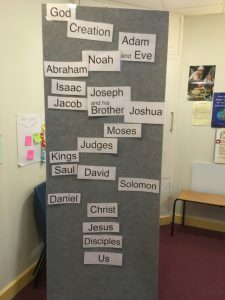 The children in my class have all sorts of ideas about doing their own Bible stories, acting them out, using puppets, art and music…It was a great stimulus for the Diocese art competition which we are planning to enter.